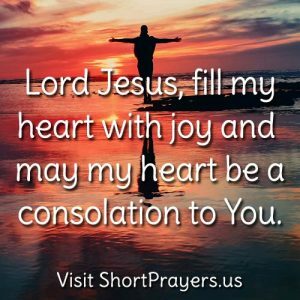 Lord Jesus, fill my heart with joy and may my heart be a consolation to You. 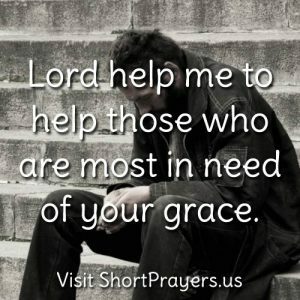 A prayerful plea for a change of heart is needed for those who feel alone and hopeless. May the Holy Spirit move each us to be Christ bearers especially to the forgotten and neglected. 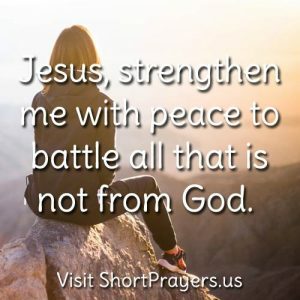 Jesus, strengthen me with peace to battle all that is not from God. True strength can only come from God. This is the strength we all need to overcome sin in all of its forms. 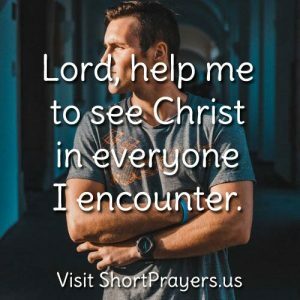 Lord, help me to see Christ in everyone I encounter. Lord, please remind me that everyone is equally loved by you and created in your likeness. Help me to appreciate everyone I meet no matter how different we may be. Jesus, help me to put my pride aside and embrace your grace. 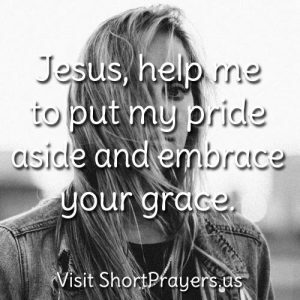 Our pride can get in the way of the graces Jesus has awaiting for each us. May we make a better effort to lessen our complaints, opinions and grudges and be open to receiving Jesus’ grace. 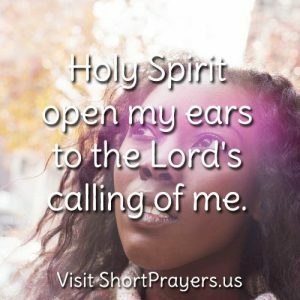 Holy Spirit open my ears to the Lord’s calling of me. Take a few moments each day to tune out the world and listen to God speaking to your heart. Prayer will open your heart to God’s grace and mercy. 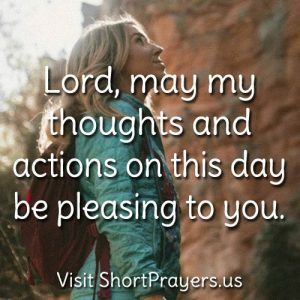 Lord may my thoughts and actions on this day be pleasing to You. Before anything else begin you day with prayer to live and act in harmony with God’s will. The Lord has a plan for your day and life be open to hearing and fulfilling his holy will. 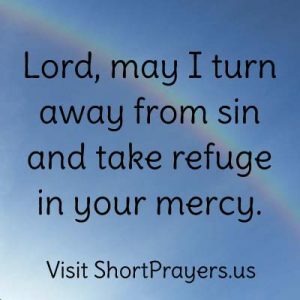 Lord, help me to turn to you and away from sin. If we don’t ask for help we’re only counting on ourselves. 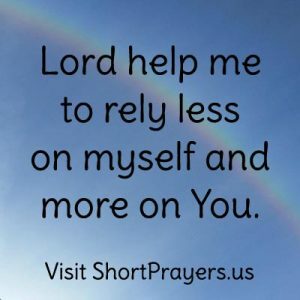 Ask for God’s help and your blessings will be greater and burdens lighter. 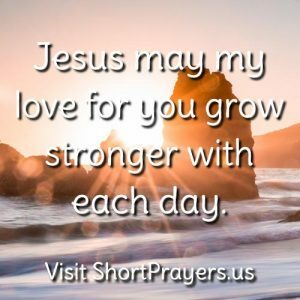 Jesus may my love for you grow stronger with each day. Ever have a day go by and you forgot to pray? Make an effort to say prayer as soon as you wake up. God has prepared a day full of grace for you make it daily priority point to praise Him. 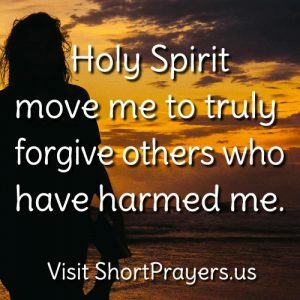 Holy Spirit, move me to truly forgive others who have harmed me. Forgiveness can be difficult but we are all called to forgive others. God’s forgiveness constantly awaits us, may we not hold back forgiving anyone who has hurt or offended us in any way. Lord, thank you for my talents may I use them to glorify your Son. Each of us is blessed with unique gifts and talents. May we use our God given gifts to bring glory to the Father, the Son and the Holy Spirit. 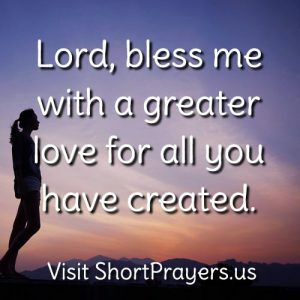 Lord, bless me with a greater love for all you have created. May each of us give thanks to God for all of his creation. Life is a gift for which we should be eternally grateful. Lord may I put aside my worldly desires and solely serve you. Worldly goals and distractions can keep us apart from God. Let each of us strive to serve not ourselves but our Creator. Lord strengthen me to better serve you. Call upon God for the strength and conviction to live in accordance with His Holy Will. 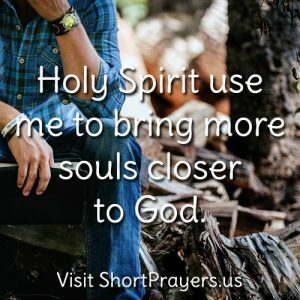 Holy Spirit use me to bring more souls closer to God. Every meeting affords us the opportunity to show God’s love to others through kindness and good deeds. Lord I pray for those suffering that they draw close to you. May we offer up our joys, sorrows and suffering for those dealing with the illness and despair. 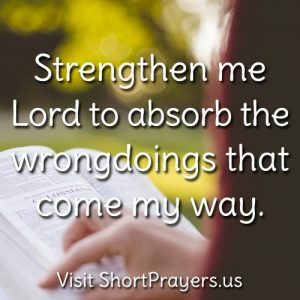 Strengthen me Lord to absorb the wrongdoings that come my way. Turning the other cheek is certainly more easily said than done. Pray for the presence of mind to discern and react or not react as God would like. 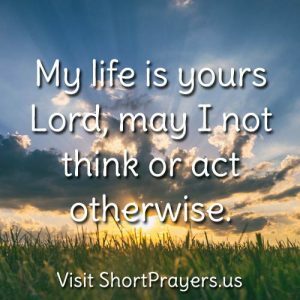 My life is yours Lord, may I not think or act otherwise. God gave us his only begotten son Jesus, may we strive to give ourselves to God on a daily basis. My blessings are abundant, may I forever give God thanks and praise. Few words are more appreciated than thank you. May each of us remember more frequently to thank our savior Jesus for our blessings. I pray for those blinded by earthly riches and distractions may they come to know Jesus. God has no tense. He is not past or present or future but God is past and present and future. 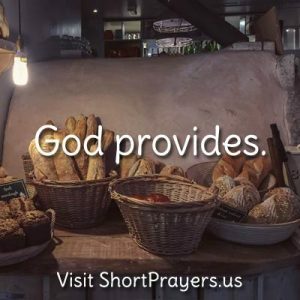 So rather than God will provide – God provides! 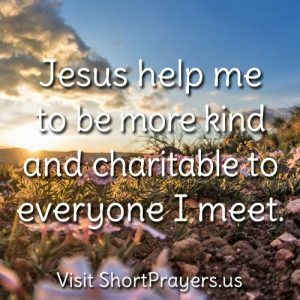 Jesus help me to be more kind and charitable to everyone I meet. It’s not easy to be nice when others are hostile towards you. 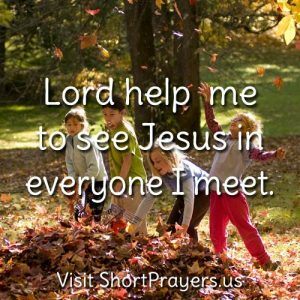 Ask God for the grace to see Christ in each individual we come to know. 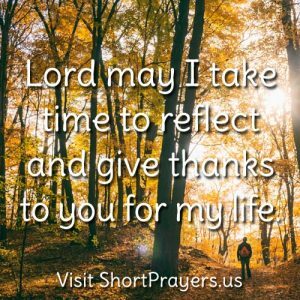 Lord may I take time to reflect and give thanks to you for my life. Most of us are blessed with an abundance of time but often squander it on TV, social media and other distractions. May we put these earthly pursuits aside and spend more time with our creator. 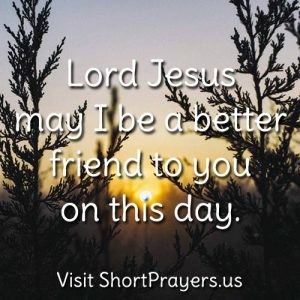 Lord Jesus may I be a better friend to you on this day. We have no greater friend than our Savior Jesus who lived, suffered and dies for each of us. We can never repay the debt we owe him but we strive to be a better friend to Him. 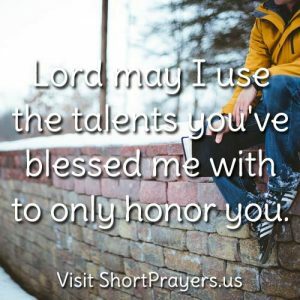 Lord may I use the talents you’ve blessed me with to only honor you. 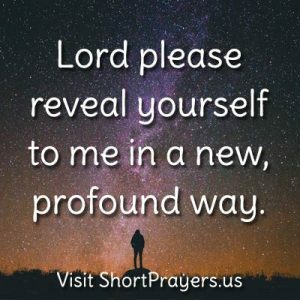 Each of us have been blessed with unique talents, may our focus in life be to use our God given talents to honor our Creator. Holy Spirit fill my heart with a greater desire to serve Jesus. Jesus I offer up my joys, sorrows and burdens to you. Offering up our daily life to Jesus is intended to bear fruit. Make it a part of your day to frequently offer up and give thanks to God for all of life’s moments. 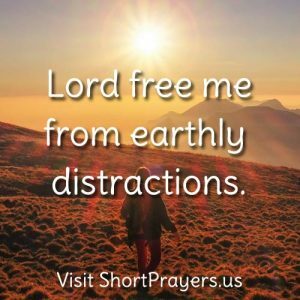 Lord free me from earthly distractions. Pray for a greater faith to turn away from any action or inaction that keeps you from getting closer to God. 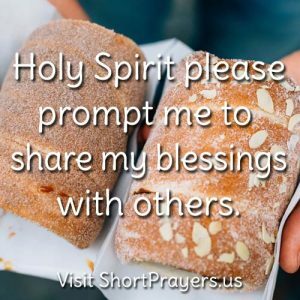 Holy Spirit please prompt me to share my blessings with others. God has blessed every one with unique gifts. He wants us to enjoy and share our gifts of time, talents and treasures with family, friends and strangers. 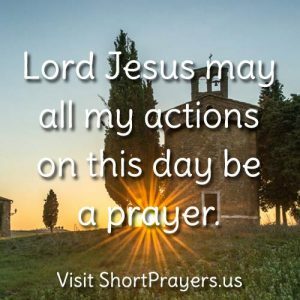 Lord Jesus may all my actions on this day be a prayer. Prayers needn’t be words. Anything can be a prayer if it is offered up to God. Thoughts, deeds, work, chores, even sleep can be a prayer if we give it in thanks to God. 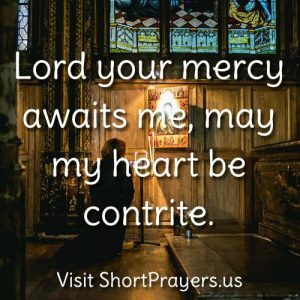 Lord your mercy awaits me, may my heart be contrite. God’s love for each of us is unfathomable and his mercy is inexhaustible. May each of us pray with contrite hearts to receive the fullness of God’s goodness. 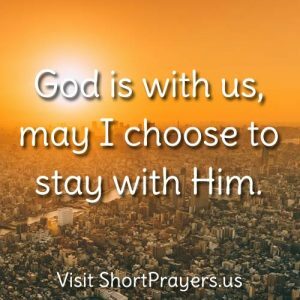 God is with us, may I choose to stay with Him. God is with us unceasingly, may I have a greater desire and put forth a greater effort to turn away from sin and be with God. 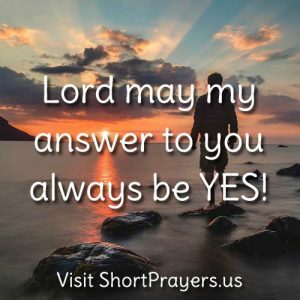 Lord may my answer to you always be YES! God calls each of to follow him. Some paths are easier than others but submission to God’s will is admission to his kingdom. 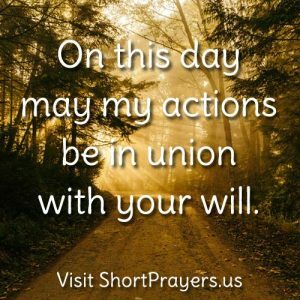 Lord, on this day may my actions be in union with your will. 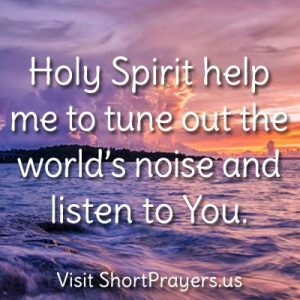 Turn to God frequently throughout your day and ask for the Holy Spirit to help you to act in accordance with God’s holy will. It’s easiest to do what is right when we’re guided from above. Jesus renew wholesomeness among us. Strive to put Jesus at the center of your life and pray for His healing to free you from sinful actions and thoughts. 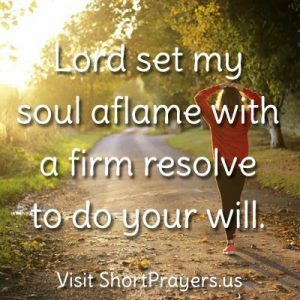 Lord set my soul aflame with a firm resolve to do your will. Bad habits and laziness are but a few “excuses” which inhibit us from fulfilling God’s plan for us. 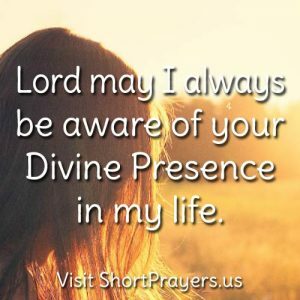 Pray for a deeper spiritual awakening to work with and for God. 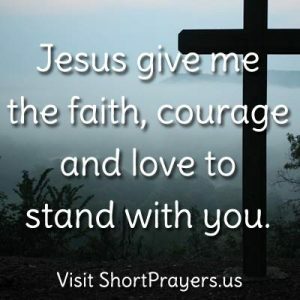 Jesus give me the faith, courage and love to stand with you. Standing up for what is right isn’t easy, especially when we feel like we’re going at it alone. Call upon the Holy Spirit for the graces to do the right thing. 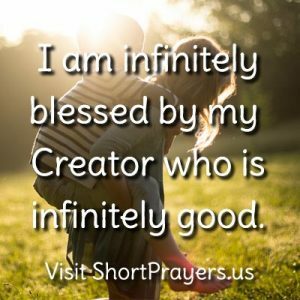 I am infinitely blessed by my Creator who is infinitely good. Everyday is a blessing, every breath. Look for miracles in a sometimes mundane life and you will surely find them. Laughter is a miracle. From out of nowhere joy! Joy from God above. 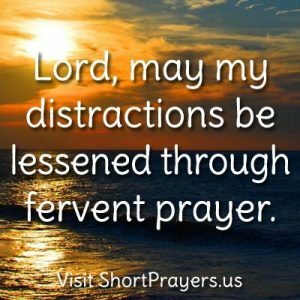 Lord, may my distractions be lessened through fervent prayer. It’s difficult to do anything when one is bombarded by distractions. 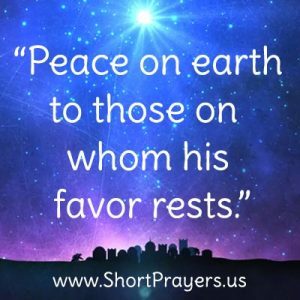 Retreat to a quiet place to pray and draw strength, peace of mind and God’s grace to keep you focused on eternal salvation. 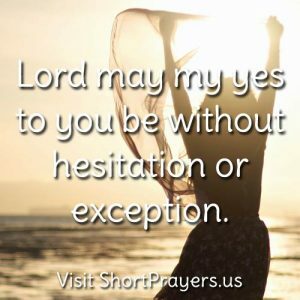 Lord, please bless me with a deeper desire to serve you. Serving God in everything we do should be first and foremost in our lives. But that’s often easier said than done. Ask God for the Holy Spirit to give you a boost to get and stay on His track. 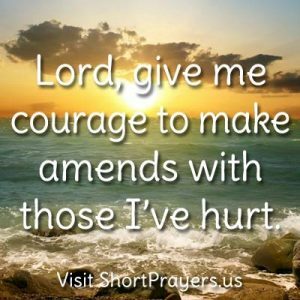 Lord, give me courage to make amends with those I’ve hurt. Apologizing to those we have hurt is never easy but most always welcomed. Pray for the grace and courage to make things right with friends or family you have offended. Often we get caught up in our daily routines that we neglect to take a break and offer up our day to God. God doesn’t want to be left out of your day rather He would like to be there for us even through the mundane. Ask God to be with you throughout the day. 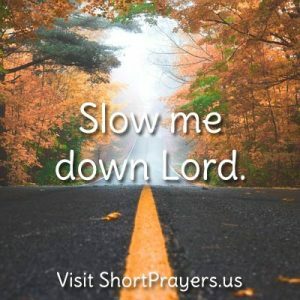 That’s where a prayer like Slow me down Lord comes in handy. 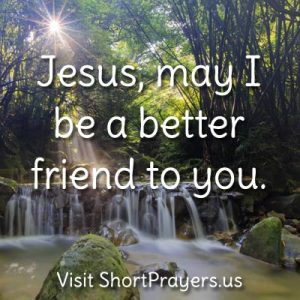 Jesus, may I be a better friend to you. Jesus is with each of us for each and every moment of our lives. May I take more time to appreciate and acknowledge and share in His friendship. God’s unfathomable love for mankind came to earth in the infant Jesus! How awesome and wonderful God is to each of us! 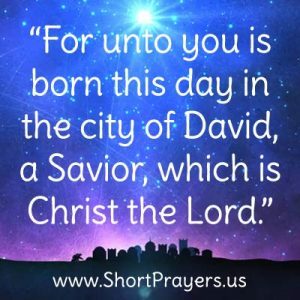 May all glory be given to God for sending us his Son to save the world from sin. 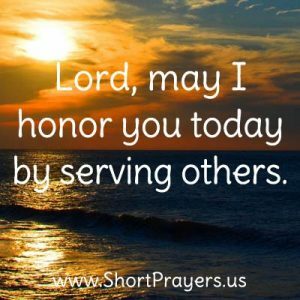 Lord, may I honor you today by serving others. We are each called to serve others through which we help fulfill God’s divine plan. May we pray and discern the role God has for each of us and act according to His will. 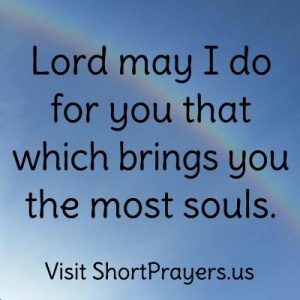 Lord may I do for you that which brings you the most souls. On his Cross, in agony, Jesus said “I thirst”. Jesus unceasingly thirst for the salvation of sinners. May we do our part to help bring souls to God through good works and prayer. 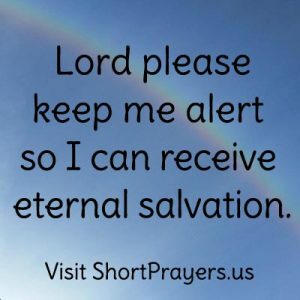 Lord please keep me alert so I can receive eternal salvation. Pray to our Savior to wake up from worldly slumber and live life focused on salvation for ourself and others. 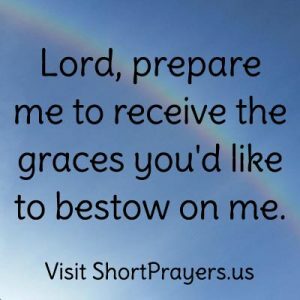 Lord, prepare me to receive the graces you’d like to bestow on me. God has an infinite amount of grace for each of us. May the Lord transform me to be more worthy and accepting of His grace. 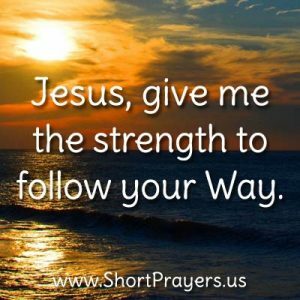 Jesus, give me the strength to follow your Way. Following Jesus is never the easy road. Rather it’s a difficult path that can only be accomplished with God’s help. Lifting our cross and following Jesus is the surest way to heaven. Jesus, please give me the strength to follow you. 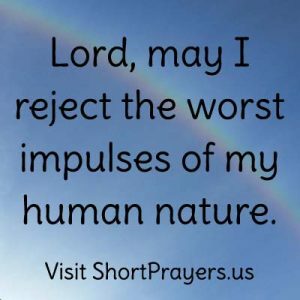 Lord, may I reject the worst impulses of my human nature. With the world’s constant bombardment of sensual images and messages may we turn to God to turn away from temptations and sinful behavior. 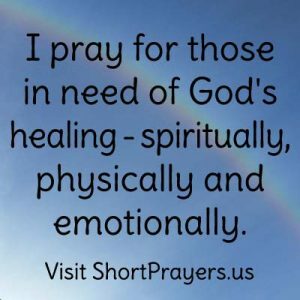 I pray for those in need of God’s healing – spiritually, physically and emotionally. Everyone is need of healing of some sort and all true healing comes from God through the Holy Spirit. Ask God to send his healing Spirit to yourself and those in need of strength and peace. 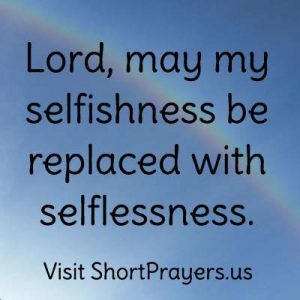 Lord, may my selfishness be replaced with selflessness. Focusing on what I want often does little to serve others. May I focus less on serving my needs but rather serve others for the glorification of God. 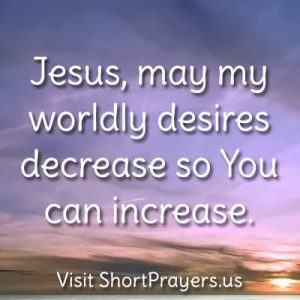 Jesus, may my worldly desires decrease so You can increase. Being consumed with worldly thoughts and deeds can relegate God to being secondary in our lives. Make God first and pray to make room in your heart for Jesus. 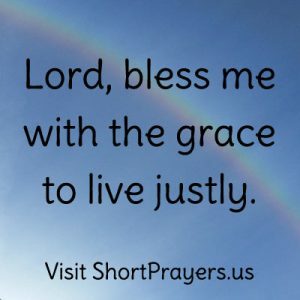 Lord, bless me with the grace to live justly. Doing what is right and fair to yourself and others requires God’s grace. May I constantly ask my Creator to guide me to live in accordance with His will. 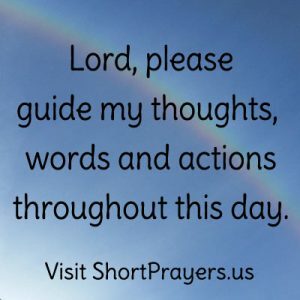 Lord, please guide my thoughts, words and actions throughout this day. Human beings can have a tendency to go it alone. Trying to figure things out without asking for help can only get you so far. Ask for help from God early in your day and throughout your day to ensure you don’t go astray. 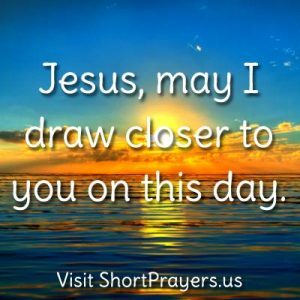 Jesus, may I draw closer to you on this day. Starting your day off with a goal is always a good thing. 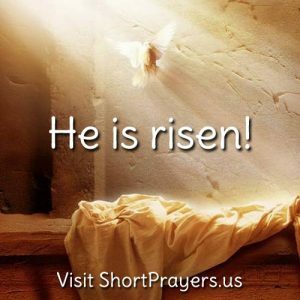 Make it your goal on this day to bring yourself closer to Jesus through prayer and sacrifice. 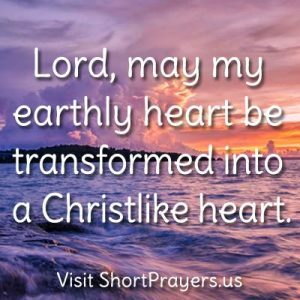 Lord, may my earthly heart be transformed into a Christlike heart. Our hearts are often so rooted in our earthly ways and habits. May we strive to put aside all that keeps us close to God and pray our hearts are in sync with God’s will. 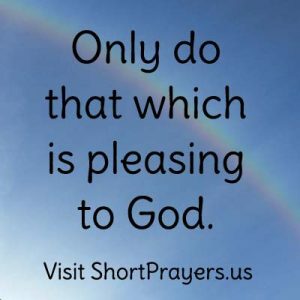 Only do that which is pleasing to God. So simple to say but so difficult to live out. 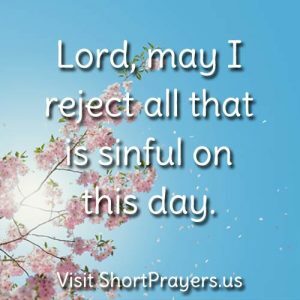 As St. Paul struggled “…for I am not practicing what I would like to do, but I am doing the very thing I hate” so do we, but we must make every effort to do what is right and ask forgiveness for those times we fall short. 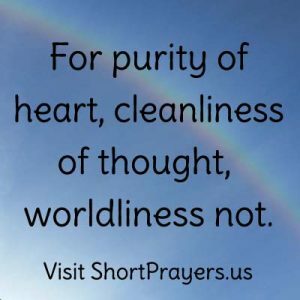 For purity of heart, cleanliness of thought, worldliness not. With a pure heart, one can walk courageously with God and be blessed with the strength needed to not give in to the temptations of this world. 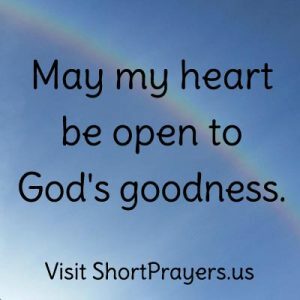 May my heart be open to God’s goodness. 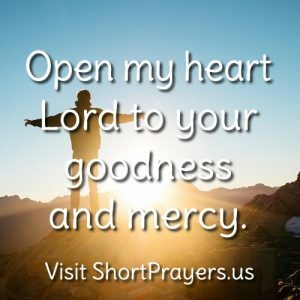 Opening our hearts to God’s love, forgiveness and mercy requires trust. Trust in God and leave the heavy lifting to Him.